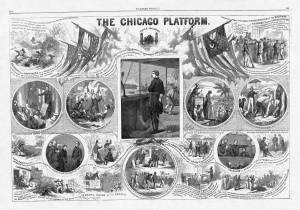 The Democrats assembled in Chicago on August 29, 1864, for their national nominating convention. The following day Governor Horatio Seymour of New York was elected to preside at the convention and a stridently anti-Lincoln platform was adopted with only four dissenting votes. This Thomas Nast cartoon is an intricate double-page spread that interweaves twenty pictures with extracts from the Democratic platform, McClellan’s letter of acceptance, and a Pendleton speech. Like his "Compromise with the South," this Nast illustration was highly effective as a propaganda tool for Lincoln’s reelection campaign. Like “Compromise with the South,” it was printed as a poster and widely distributed throughout the country.